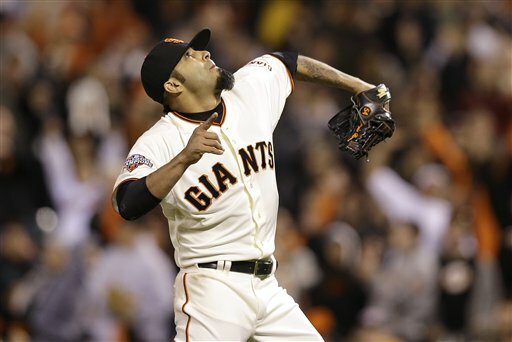 The San Francisco Giants went from four All-Star starters in 2012 to none in 2013. But the Giants will be represented by three players in this year’s Midsummer’s Classic in New York as reserves — Buster Posey, Marco Scutaro and Madison Bumgarner. Here are the NL starters for the July 16 game at Citi Field as voted upon by the fans. OK, so how did MoreSplashHits did from our projections posted earlier this week. Well, pretty darn good. Of the 33 players we projected to make the All-Star team, 29 actually made it. One miss we had no control over, and that’s because of the fan vote. We had Justin Upton, because Upton was No. 3 in voting when we made our post. Harper passed Upton in the closing days of voting. We did say that neither player would make the team if he did not win the vote, and Upton did not make the team. SP TRAVIS WOOD, CUBS: Wood is a solid pick to represent the Cubs with 5-6 record and a 2.69 ERA in 17 starts. We went with a reliever, Kevin Gregg, who is 2-1 with 1.59 ERA with 14 saves in 15 opportunities in 29 appearances. SP MADISON BUMGARNER: Bumgarner has been the Giants’ best starting pitcher this year. He is 8-5 with 3.08 ERA in 17 starts. Bumgarner actually ranks 15th in the NL in ERA among starters. To put him on the team, Bochy had to leap from pitchers like Mike Leake (2.73), Shelby Miller (2.80), Hyun-Jin Ryu (2.82) and Mat Latos (3.03). 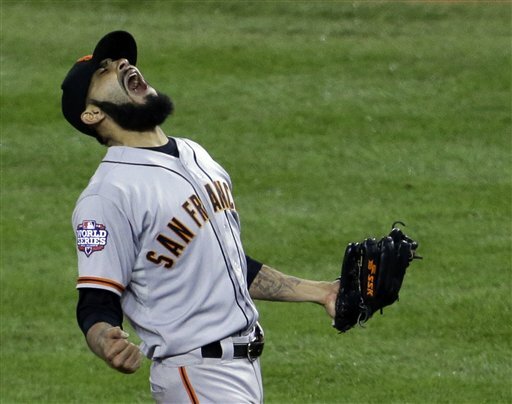 We went with Sergio Romo as Bochy’s pitching pick from the Giants. At 3-3 with a 2.32 ERA and 19 saves, we felt that would be easier to defend than Bumgarner. 2B MATT CARPENTER: This was a logistics decision. We thought Bochy would go with a third catcher, so we had Wilin Rosario of the Rockies on the team. Going with two catchers means that Molina likely will catch five innings, then Posey will come in to catch the last four innings. But what happens if the game goes in extra innings. Bochy surely doesn’t want Posey catching more innings than necessary. Now, it is likely that Troy Tulowitzki won’t play because he’s still on the DL. With two reserve shortstops (Segura and Cabrera) on the roster, Bochy could choose to replace Tulowitzki with another Rockies player — Rosario — and then he’ll have three catchers. As it is now, Carpenter earned a spot on the team that Rosario did not. Actually, we don’t know if Carpenter earned a spot through the players vote and Bochy picked Scutaro, or the other way around. The 2013 All-Star voting is boiling down to the final hours. Balloting is down to online voting from now until 11:59 p.m. on Thursday, the Fourth of July. Last year, during this period, there was a flood on votes cast. For example, Yadier Molina was the leading NL vote-getter when the most recent results were released Tuesday with almost 5.1 million. By the time the final surge of votes are counted, he may need more than 7 million votes to keep the title of leading vote-getter. So a lot can still change. The All-Star teams will be announced on Saturday. Still, MoreSplashHits is taking our best guess as to what the NL All-Star team might look like. We’ll start with an assumption (a very shaky assumption at that) that the vote leaders won’t change in the final days of voting. But that at least serves as a starting point. The position leaders we feel most likely will hold onto their leads and be voted All-Star starters are SS Troy Tulowitzki (although he’s injured and likely will be replaced) and OF Carlos Beltran. We’ve added an “IF” section for those positions where the vote is close. We’ve included their July 2 vote total, and lead over No. 2 vote-getter at their position. The players vote on eight pitchers (five starters, three relievers) and the eight backups at each position. So this is a prediction on who those players would be based on the aforementioned projected starters. When players vote, it’s often more about reputation than results. But I think the players will get this mostly right. The one reputation vote goes to Chapman. Results say better options could be Jonathan Papelbon of the Phillies, Edwin Mujica of the Cardinals or Rafael Soriano of the Nationals. But Chapman brings the heat. It’s not a bad pick. When Chapman is on, he’s filthy. The other tight vote goes to Scutaro. Results here say Matt Carpenter of the Cardinals is the better pick, if you base that off this year’s numbers. But if you go back to the second half of last year, then Scutaro is clearly deserving. When you add Scutaro’s postseason heroics and the fact he’s a 37-year-old veteran who has never made an All-Star team, Scutaro becomes a sentimental pick. This is where Bruce Bochy comes in. And it’s not just Bochy picking his nine favorite players. There are other factors, including making sure every team is represented and picking a third catcher. OK, first the team reps. For the Marlins, a month ago it may have been closer Steve Cichek. But his ERA is on the rise. And a nod to a 20-year-old rookie would be nice bonus for Marlins fans looking to the future. For the Cubs, the best position player candidate is OF Nate Schierholtz. No kidding! Schierholtz. But really it’s down to starting pitcher Jeff Samardzija and Gregg. Samardzija has a lot of K’s, but a losing record (5-7). Gregg has been great out of the pen. For the Padres, the two candidates are up the middle: Cabrera or rookie Jedd Gyroko. Both deserving to represent the Padres, but the Tulowitzki unlikely to play (opening a roster spot for the Nationals’ Ian Desmond), Cabrera seems like the smart choice. As for the rest, Lee and Locke are solid choices. Romo is the easiest Giants selection for Bochy to defend (and if you go back to second half of 2012 plus the postseason, it’s not a bad pick). Rosario would be the third catcher (always a must in an All-Star game), and sluggers Brown and Craig round out the team. Bochy will get to select the five candidates for the fans to vote for the last roster spot. All of these five players are deserving. Carpenter could have been picked over Scutaro. Choo or Bruce over Brown. Freeman over Craig. Soriano over Chapman. I don’t see Bochy opening up a spot on this vote for Yasiel Puig (unless MLB makes him). Bochy loves veterans, and is unlikely to open a spot for a guy who has been up for four weeks. And frankly, we agree with that thinking. Votto, Wright and Phillips are good bets to hold onto their leads. But if by chance they end up losing the vote, they will win on the players vote. The same is true for Molina if Posey makes a late surge. If Carpenter pulls off the upset at second base, that could bump Scutaro into a manager’s pick, bumping either Brown or Craig off the team and onto the Final Five vote (bumping Soriano off Final Five). While Scutaro is battling back issues and mallet finger — meaning he could use the break — I think Bochy would select him anyway, then maybe just give him a pinch-hitting opportunity in the All-Star Game. Upton holds a narrow lead over Bryce Harper for the final outfield spot. I don’t think either makes the team if they don’t win the voting. Upton got off to a torrid start, but has cooled WAY down since and is hitting below .250. Harper has just been activated after spening a month on the DL. Matt Holliday and McCutchen are within striking distance in the voting, and don’t count out Hunter Pence (in 7th in voting) if Giants fans get out the vote again. How many San Francisco Giants are leading vote-getters at their position for All-Star Game? NONE! What’s going on with the San Francisco Giants fans? Are they depressed by the team’s recent hitting woes? Have they let the team’s string of injuries drag them down? Or are they simply laying in the weeds to make another big last-minute surge in the polls like they did last year? None. Nada. Zilch. A big fat goose eggs (and we are not talking about Pablo Sandoval). David Wright of the Mets has surpassed Pablo Sandoval as the top vote-getter among third basemen, and Yadier Molina of the Cardinals has passed Buster Posey as the leader among NL catchers. Molina, in fact, is the leading vote-getter among all NL players with almost 3.6 million votes. Oddly enough, Posey is the second-leading vote-getter for all NL players with a little more than 3.5 million votes. Last year, Posey set the record for the most votes received by any player elected to the All-Star game with more than 7.6 million votes. A huge chunk of those votes came in the final week of balloting — all of which was done online — when Giants fans flooded the ballots to elect Posey, Melky Cabrera and Pablo Sandoval as NL all-star starters. Voting for the 2013 All-Star Game will continue through July 4, so there’s plenty of time for another Giant surge of votes. And it’s not like Giants fans aren’t voting. Four Giants are the No. 2 vote-getters at their positions. In addition to Posey, Sandoval trails Wright at third base (2.92 million to 2.79 million), Marco Scutaro trails Brandon Phillips at second base (2.6 million to 2.27 million) and Brandon Crawford trails Troy Tulowitzki (3.1 million to 1.76 million). Additionally, Brandon Belt is fourth at first base (behind Joey Votto, Paul Goldschmidt and Allen Craig). In the outfield, Hunter Pence is 8th, Angel Pagan 10th and Gregor Blanco is 13th. It’s hard to ignore that Cardinals fans are getting the vote out. There are only two teams that have players listed among the top five at every infield position and all three outfield candidates listed in the top 13 — the Giants and the Cardinals. Allen Craig is No. 3 at first base, Matt Carpenter is No. 3 at second base, Pete Freakin Kozma is No. 4 at shortstop, David Freese is third at third base, Molina leads at catcher and in the outfielder, Carlos Betran is No. 1, Matt Holliday is No. 6 and Jon Jay is No. 12. What?!? Only two San Francisco Giants leading All-Star voting? San Francisco Giants fans should be ashamed. The first results of All-Star voting was released Tuesday and two Giants — catcher Buster Posey and third baseman Pablo Sandoval — lead their position in NL voting. After last season, when the Giants had three players voted as NL All-Star starters and several other less-than-deserving players finish high at their position in the voting, the first release of numbers may be a surprise. Only two Giants lead their positions? Well, actually, several Giants are faring well in early voting in 2013. 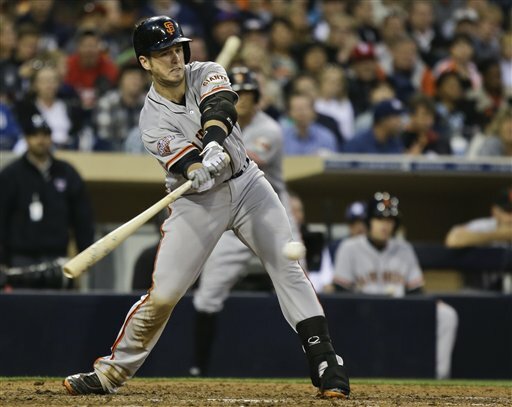 Three players — Marco Scutaro, Brandon Crawford and Brandon Belt — are second at their position. Hunter Pence is sixth among outfielders. Buster Posey is the leading vote-getter among NL players, by almost 100,000 votes over Atlanta’s B.J. Upton. Generally, the biggest movement in vote totals comes in the final week of ballotting. But so far in the early going, the Giants are in good position. Here are the leaders at each position and where the Giants currently stand. For all the belly-aching by fans across the country and the rabid tweets from Mets president Sandy Alderson, the fans and Tony LaRussa got it right in putting four San Francisco Giants into the starting lineup of the NL All-Star team. CF Melky Cabrera: 2 for 3, home run, two runs, two RBI. P Matt Cain: 2 IP, 1 hit, 0 runs, 0 BB, 1 strikeout, win. If you missed the start of the game, you missed a thrilling first inning. After Carlos Gonzalez struck out to open the game, Cabrera singled to left and scored on Ryan Braun’s double. After Joey Votto struck out, Carlos Beltran and Buster Posey drew walks. Braun, Beltran and Posey all scored when Sandoval dug out a Verlander curveball and hit it off the wall just inside the right-field foul pole for a triple. Just like that, it was 5-0 National League. Cabrera grounded out to second in the second. Posey popped out to catcher Mike Napoli in the third and Pablo Sandoval flied to center in the fourth. But Cabrera capped the exciting night for the Giants by hammering a two-run homer to left off the Rangers’ Matt Harrison, making it 8-0. 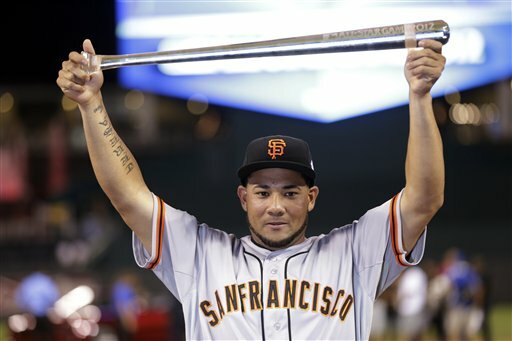 That home run made Cabrera the first Giant to be selected All-Star Game MVP since Bobby Bonds in 1973 in a game also played in Kansas City. He can also thank Jose Bautista for the MVP trophy and the Camaro that came with it. Bautista made a nifty sliding catch on a looper off the bat of Braun in the second inning. If Bautista doesn’t make that play, Braun finishes the night 3 for 3 with a single, double and triple … and likely with an MVP honor. After all the Giants left the game, the All-Star Game went quiet. Cain earned the victory, becoming the first Giants pitcher to earn an All-Star win since Vida Blue in 1981. For the second time this season, Matt Cain has helped establish a Giants franchise first. Last month, Cain became the first pitcher in Giants history to throw a perfect game. 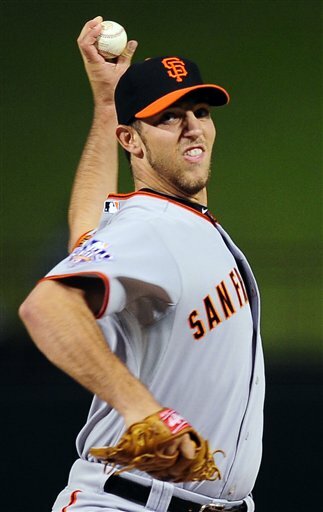 On Tuesday in Kansas City, he will become seventh Giants pitcher to start the All-Star Game for the National League. Cain’s selection as the NL starter by manager Tony LaRussa gives the Giants four All-Star starters for the first time in franchise history. In short, if you’re a Giants fan, be sure to tune into the All-Star Game early. 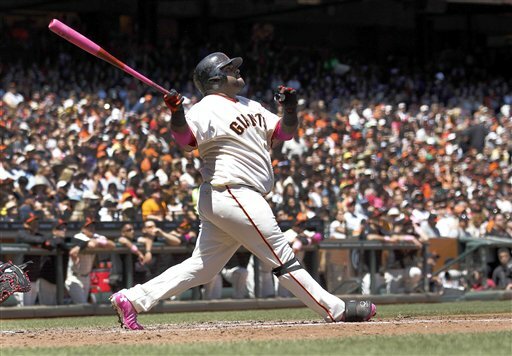 Cain is joined on the starting lineup by catcher Buster Posey, third baseman Pablo Sandoval and outfielder Melky Cabrera, all voted starters in fan voting. This is Cain’s third All-Star selection, but it will be the first time he’ll actually get to pitch in the game. Cain was not used in 2009 by manager Charlie Manuel, and last season he pitched the Sunday before the All-Star Game, making him ineligible to pitch in the midsummer’s classic. Let’s hope Cain has better success than other recent Giants pitchers have fared as All-Star Game starters. In their first three All-Star starts, Giants pitchers (Carl Hubbell and Juan Marichal twice) did not allow a run, giving up a combined four hits in nine innings. Marichal was the All-Star MVP in 1965. But since then, three of the last four Giants All-Star starters were tagged for at least two runs, although none of them ending up as the losing pitcher.